A long time ago, I took a poetry writing class that had a really big impact on my ability to write LDS music. For the time being, by the way, we’re going to set aside the debate as to whether or not songwriting and poetry are equatable. I’ll make a note to do that one later. We talked a lot about imagery, alliteration, onomatopoeia, rhyming, meter, form, metaphor, similie, personification, and about a million other traditional literary devices. The really cool thing about this class above all other writing classes I ever took, however, was that we really delved deep into the source of the poetry, and how to truly express the most impact using the fewest words possible. We got right down into the nature of art as a means of expression and self-discovery. 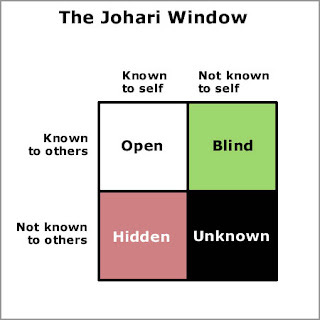 To that end, the instructor taught us a model called the Johari Window. This is a pretty famous model, and it’s used in a myriad of situations, from psychological studies to business and communications training. This instructor taught it to us as a way of becoming more and more self-aware. There are four panes to the window. The top two panes represent the things about us that are known to others around us. The bottom two panes represent all those things around us that others can’t see. Meanwhile, the left two panes are things we know about ourselves, and the right panes are those that are parts of ourselves that we don’t know. The second pane, is our “blind spot”. These are things about us that others can see, but we, ourselves, don’t know, don’t get, or (often) don’t want to see. Our character flaws and blemishes often are in this category. Good things we do, but often overlook or discount can also be here. The “hidden” part of ourselves is full of things that we know about, but the rest of the world doesn’t. We usually try to keep it that way. These are the skeletons in our closet, that we don’t want anyone to see. The final pane in the window is the “unknown” area. This is what we don’t see, and what the world doesn’t see, either. This is the area of the subconscious, and it’s often thought of as a scary place. It’s also where the best songs you will ever write come from. As we went through the class, the instructor gave us many assignments to write and rewrite, and much of them were geared toward shining light into this dark and confusing area of our souls. As the years have gone by, I’ve continued to search that area. I’ve discovered that not every song I write comes wholly from that space. Some are well in the first pane, and some from the second. I’ve also learned that there’s a little bit of the unknown pane in almost every creative endeavor you do. I’ve explored it a lot with prayer as well as effort. As an LDS musician, I’ve found that, with God as my guide, it’s not as scary as you might think. Each new thing that I’ve discovered about myself has only helped me to know the real me better. And after I get through the weirdness of that discovery, I’ve always found that I like me a little better each time. Even though the instructor was as areligious as you could get, even a bit anti-religious, she helped me to be a better member of the church, and helped me, in the long run, to make better LDS music.